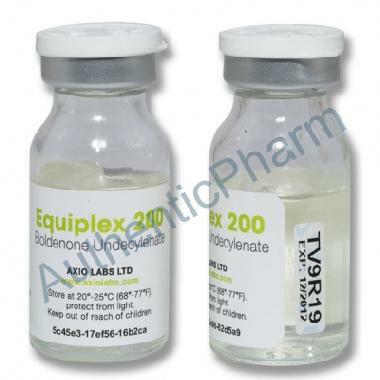 Boldenone (1,4-androstadiene-3-one-17?-ol, available as the undecylenate ester)is an anabolic steroid developed for veterinary use, mostly for treatment of horses. It is not indicated for use in humans in the US and is only available through veterinary clinics. The activity of boldenone is mainly anabolic, with a low androgenic potency. It has a very long half-life, with minimal blood levels present up to 8 weeks after discontinued use. Boldenone will increase nitrogen retention, protein synthesis, increases appetite and stimulates the release of erythropoietin in the kidneys. The drug is commonly used in doping within bodybuilding. If intended to assist in bodybuilding, the drug is taken as part of a steroid stack of other anabolic steroids, usually with a potent androgen like testosterone as the 'base' of the stack. Boldenone has a low rate of aromatization (about 50% of Testosterone), which means it does not convert to estrogen easily and does not cause very much water retention. Many Bodybuilders will find that it is a good replacement drug for Nandrolone. It is a poor drug of choice for any athlete who will be subject to a blood test due to its long metabolic half-life. Trace amounts of the drug can easily be detected for months after discontinued use.